The Calgary Web Design Network is a professional web design and internet marketing company serving clients throughout North America since 2007. We have helped companies of all types and sizes achieve success through the power of the web and can do the same for you! Our customers will be the first to tell you that a website done right can have a huge impact for the overall success of your business. Our company specializes not only in web development but all aspects of internet marketing ensuring our clients are fully equipped to compete in today's very crowded marketplace. If you are not utilizing all that the internet has to offer when promoting your business you will be at a distinct disadvantage amongst your industry competitors. The goal of any company with a website is to generate more interest from their potential consumer base resulting in better sales, quotes or leads for your business. A website that simply looks great but does not produce any meaningul results will have a limited value at best. It is important to remember that although a website serves many purposes it is a marketing tool first and foremost. If your website is not positively effecting your bottom line in any way it is not doing it's job. 95% of all websites that exist today fall under this category. The Calgary Web Design Network prides itself on educating our clients on what is necessary to be that other 5%. Our team of experts will show you the best ways to build a website that customers actually respond to and find easily when searching for your particular product or service. Whether it's through SEO (search engine optimization), social media, PPC (pay-per-click advertising) or something else we'll point you down the best path to success! Establish whether our client is upgrading an existing website or building a new website from scratch. Have a face to face or phone meeting with a client to gather information about what didn't work in the past and establish what they want to accomplish with a new site. Do a full research analysis of our client's particular industry to find out what are they doing to be successful and what is needed to match or exceed their efforts. Establish a budget a client if comfortable with as a starting point in terms of building the website as well as marketing it to their consumers. This budget can expand over time once clients are getting the desired results. Form a strategy in terms of what the client wants their website to look like, what information it will need and what features it will require to operate successfully. Decide on what written content, images, files or other materials need to be gathered or created for the new website. Begin the initial design phase of the website. Our team will develop a draft or mock-up of the new website where the client will review it offering feedback and necessary changes. Once the design has been approved development will start on creating the actual working version of the website. Once complete the client will be able to test and try out the new website to make sure it meets with their approval. A final testing and review phase by our team will be conducted prior to the actual website launch. The client will sign off on the finished product and grant their permission to put the website online. Once the website is online it will be submitted to all major search engines including Google, Bing, MSN, Yahoo and more. When the website has been indexed in search engines the client will then decide what direction they want to go with marketing their website further. This could be immediately or at a later time as desired. If/when a client wants to proceed with marketing we will present them will all possible options including SEO, social media, pay-per-click advertising, video creation and more. We'll help our clients find "the right fit" marketing wise based on their needs and budget. Over time We will continue to asses the results of the marketing campaign regularly constantly tweaking what is necessary for better results and performance. We help our clients find the best web solutions available for them based on a budget they can comfortably afford. Whether you want to start small with simple services or swing for the fences from the get go we will have you covered! For more information call us at 403-547-5443 or you can also get a free quote at no charge or further obligation. We always enjoy speaking with any new customers and are happy to answer any questions you may have. 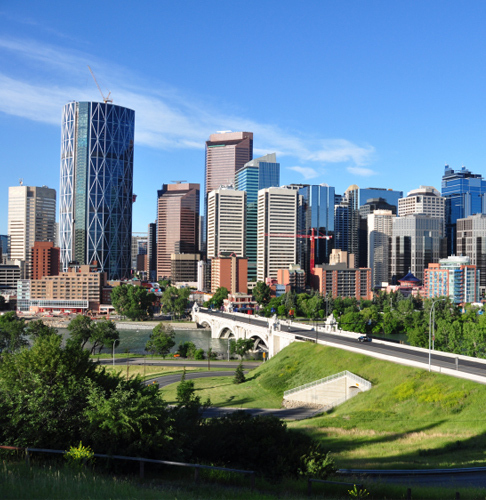 "We are a NYC based CPA firm and we were very fortunate to find Jeff Moyer and Calgary Web Design over the internet. Jeff did an excellent job with our company website, logo and business cards and provided excellent service at a very reasonable price. The website was done professionally and quickly. Whenever any additions or edits needed to be made to the website, Jeff acted quickly to get them done, making his services the best. Thanks again for your great work Jeff and I have already recommended your firm to others in the US and NYC area." The proof is in the pudding as far as our work goes and the success we are able to achieve for our clients. Take a look at some of the websites we have built so far along with the clients we have worked with throughout North America and beyond. Also check out this video for the hottest web design trends for 2014!